Courtesy photo 2017 Sectional Champions: The Galion Tigers Pictured (from L to R): Coach Bryce Lehman, Spencer Keller, Mitch Dyer, Jack McElligott, Matthew McMullen and Kaleb Harsh. HURON — The Galion Tigers golf team had an impressive regular season and that is an understatement. Galion finished the season at a perfect 14-0 and topped it all off with a Mid-Ohio Athletic Conference tournament championship. But, the young Tigers were not finished. On Thursday, the Galion linksters headed to Sawmill Creek Golf Club in Huron to compete in the Division II Northwest sectional championship. After the 18-hole event, the Tigers emerged as sectional champions, defeating runner-up Vermilion; 324-350. 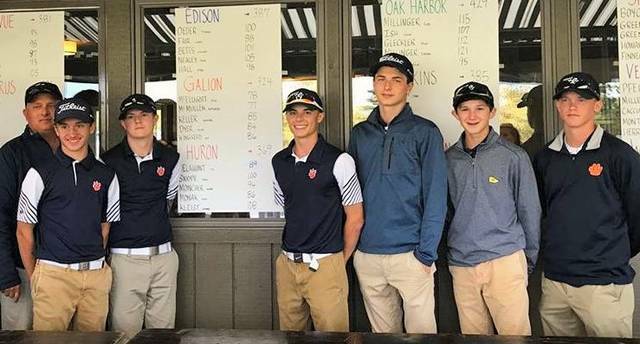 The victory secures the entire Galion squad a trip to the district event at Red Hawk Run Golf Course in Findlay on Thursday, October 5. Vermilion and third-place Huron will also advance to districts as a team. Other scores on the day were: 3. Huron- 369; 4. Shelby- 370; 5. Clear Fork- 379; 6. Bellevue- 381; 7. Perkins- 385; 8. Willard- 386; 9. Edison- 387; 10. Port Clinton- 404; 11. Oak Harbor- 429 and 12. Bucyrus- 495. Freshmen sensation, Matthew McMullen was the medalist for the entire event, shooting a 77 on the day to lead the Tigers to victory. Jack McElligott was just one-stroke behind him with a 78. Senior Mitch Dyer fired an 84, Spencer Keller contributed an 85 and Matt Kingseed turned in an 86.
https://www.galioninquirer.com/wp-content/uploads/sites/38/2017/09/web1_Sectional-Champs.jpgCourtesy photo 2017 Sectional Champions: The Galion Tigers Pictured (from L to R): Coach Bryce Lehman, Spencer Keller, Mitch Dyer, Jack McElligott, Matthew McMullen and Kaleb Harsh.